If you are looking for an efficient and secure way to archive and access your minutes documents, then MeetingBooster is the solution you have been searching for. Like most organizations, you are dependent on your employees to follow the correct procedures, but let’s face it, that is easier said than done. Whether you are trying to improve efficiency or adhere to strict regulatory compliance, MeetingBooster ensures that documents are automatically stored, without depending on employees to follow manual procedures. Meeting minutes typically contain a variety of documents, file attachments, notes and tasks. Consolidating and organizing this information can be a daunting task without a software solution like MeetingBooster. Using MeetingBooster’s integrated note card allows users to finalize their minutes documents from one location. This simplifies and streamlines the processes involved in managing meeting documents. With professional templates and customizable settings, you can create your final minutes documents with a few mouse clicks. Often times, minutes documents require approval from an executive or manager. This means that the documents must be sent, approved and returned, all while adhering to security requirements or state / federal regulatory compliance. MeetingBooster fully automates this process through the minutes document approval process system. 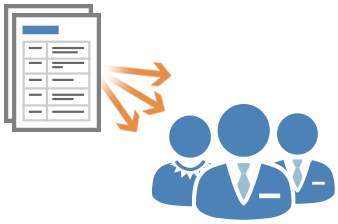 By selecting one or more people to approve the minutes, MeetingBooster sends a minutes document link to the approver(s), allowing them to electronically approve the minutes, and the final document is archived behind the permission system. 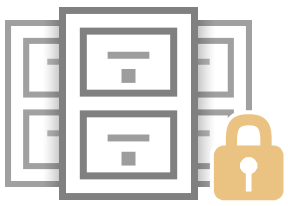 This not only streamlines the approval process, it maintains the highest level of security to ensure that your information remains safely stored behind the permission system at all times. Traditional file management solutions require a system administrator to create shared folders for the team. Then it is up to the employees to manually save the files in the correct folders, hopefully formatting them first according the company's standard for minutes documents. So what do you end up with? A shared folder full of different documents with no specific naming scheme, and if you are lucky, in date order. MeetingBooster’s archiving system ensures that employees use the correct meeting minutes formats and automatically stores the documents, making it easier to follow regulatory compliance. Don’t worry, whether you need a document for validation, or to fight a lawsuit, you can rest assured that MeetingBooster has you covered. MeetingBooster was built with security in mind. 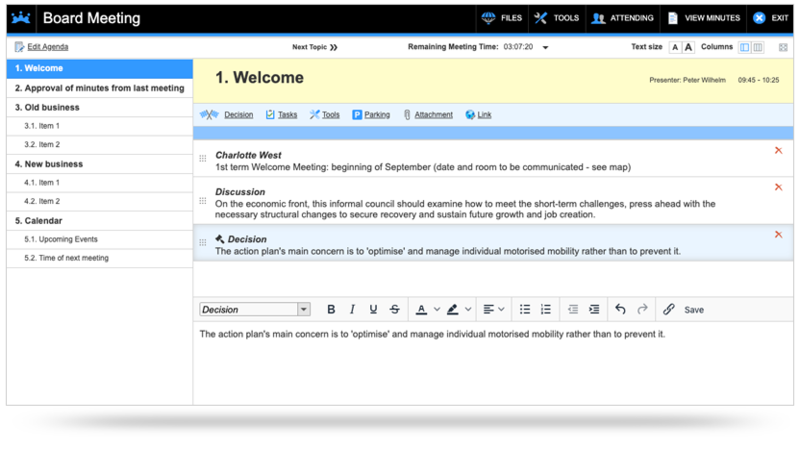 Not only does MeetingBooster automatically archive the minutes documents, it also applies the appropriate security permissions to ensure that only the intended viewers gain access to the meeting information. And if you need more guarantees, there is a log file that tells you who accessed what document and when. Ever asked your colleague about notes from the meeting, but they thought you took them? How about finding the thread of discussions on a topic that took place over several meetings? Accessing minutes documents when you need them most is vital to the decision making process. 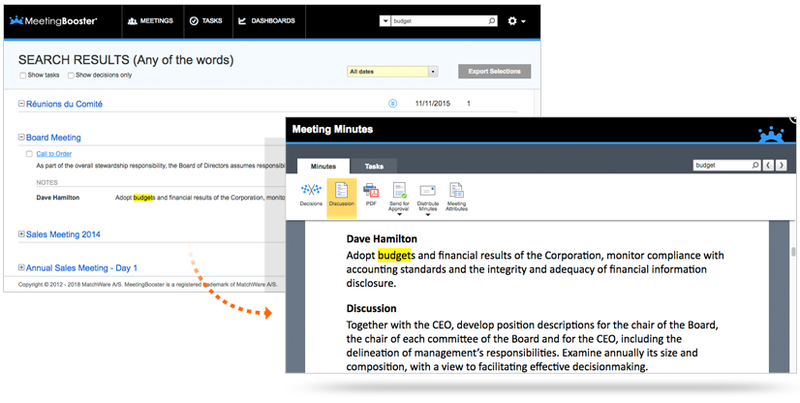 MeetingBooster’s revolutionary Search-and-Merge feature allows you to search the system globally to locate a topic that was discussed during meetings. Once you identify the instances, you can multi-select and merge them into a consolidated PDF for review or archiving. With MeetingBooster, finding notes has never been any easier and will save you a ton of time!